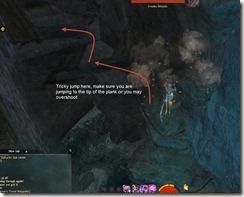 GW2 Guild Puzzles Guild Missions guide with comprehensive written and video guides for each guild puzzle. 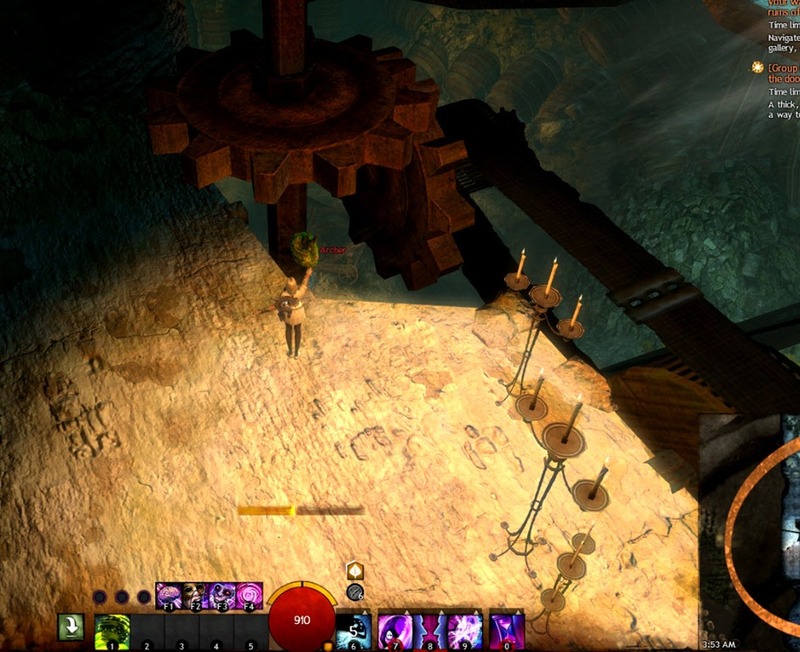 Guild Puzzles is the last series of Guild Missions to unlock. 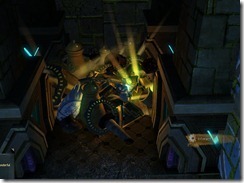 They require a minimum of six players with a time limit of 20 minutes for the entire puzzle. 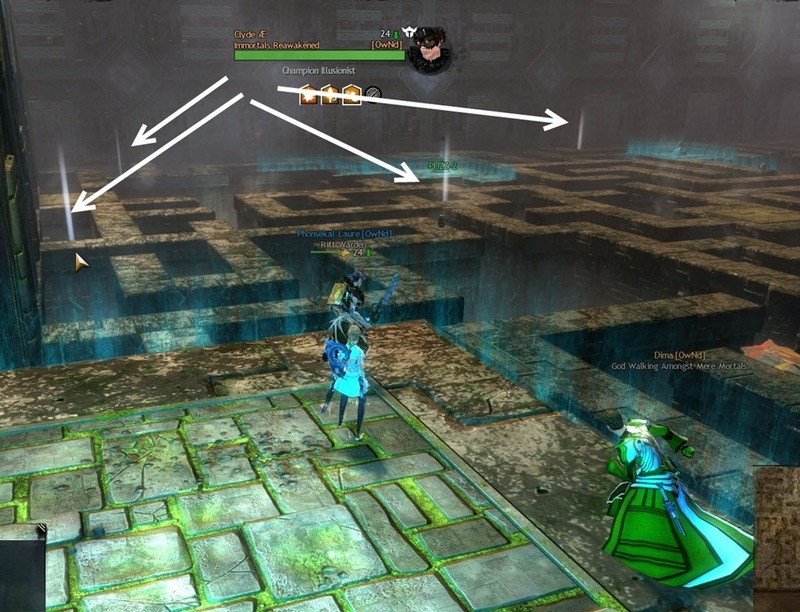 These puzzles require strict coordination from participating players with bits of platform jumping in between. 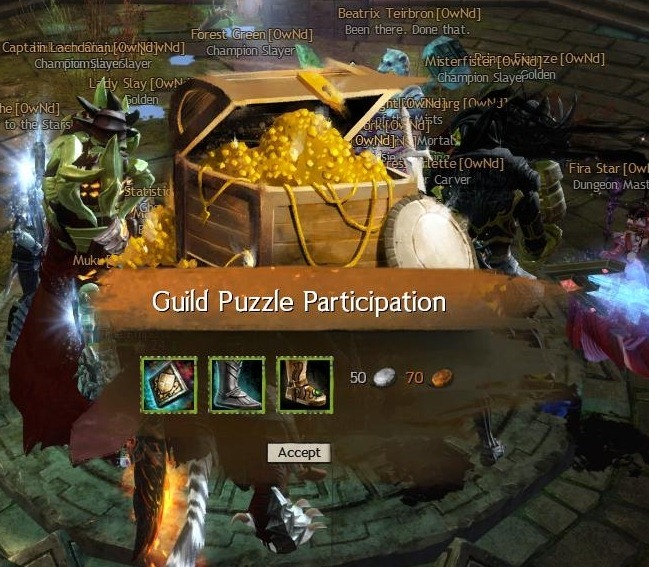 You must have Guild Bounty, Guild Trek, Guild Rush, Guild Challenge unlocked and have 250 Guild Merits before you can research Guild Puzzle. It takes 50k influence to start researching but prepared to have over 500k extra influence if you wish to acquire it instantly. 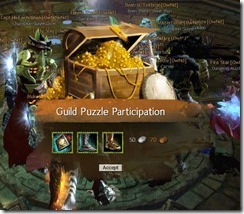 Once completed, Guild Puzzles rewards 1 Guild Commendation, 2 rares, and 50 silvers as personal rewards. 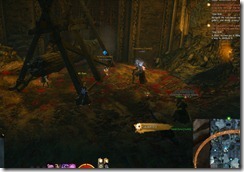 It will also reward 30 Guild Merits to the guild. 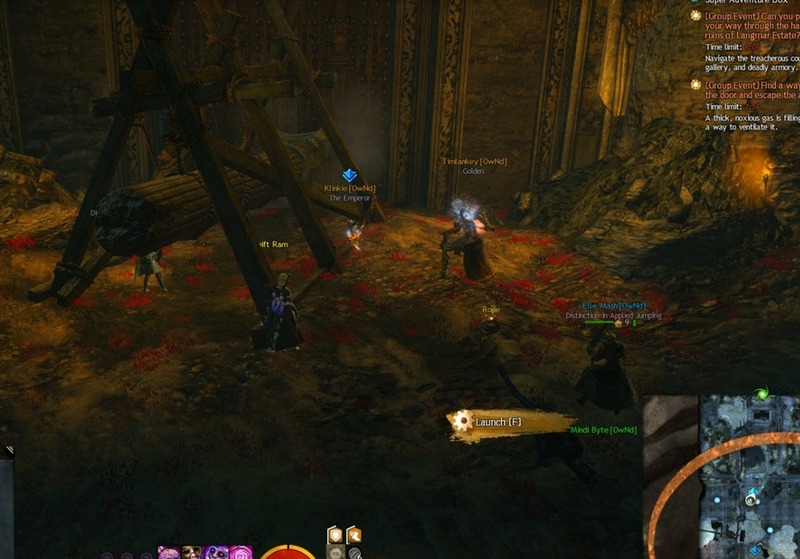 There are currently three Guild Puzzles available: Proxemics Lab, Langmar Estate, and the newly added Angvar’s Trove in the May 28 patch. 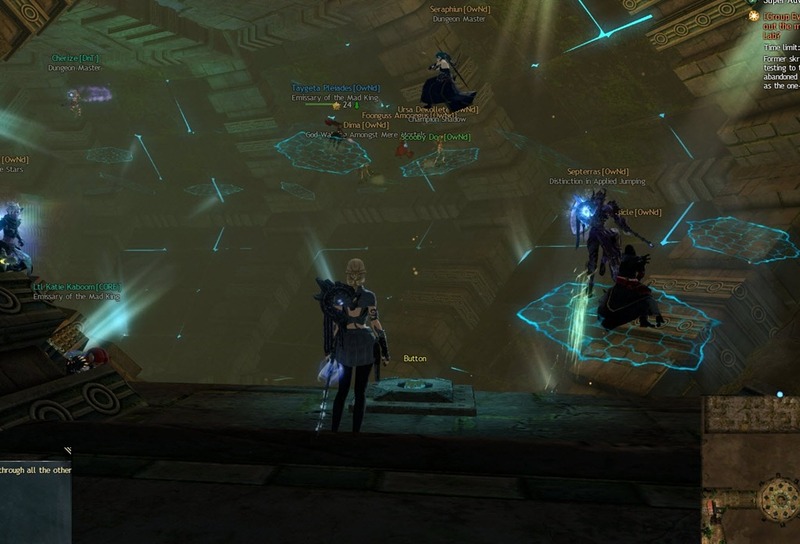 Angvar’s Trove is a new guild puzzle introduced with the May 28 update. It is located in the NW corner of Snowden Drifts near the newly added Angvar’s Trove waypoint. 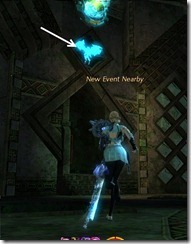 Compared to previous puzzles, this newly added puzzle have a lot more jumping involved. 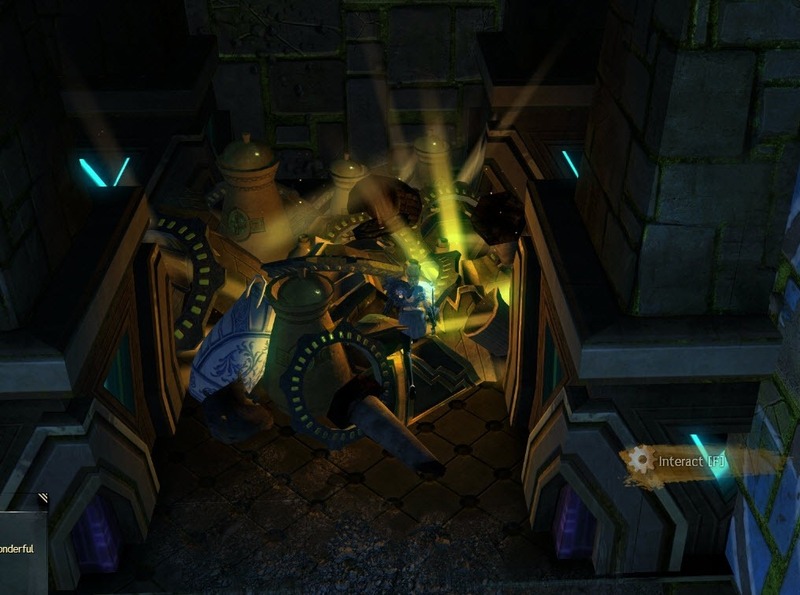 The entire puzzle have a time limit of 30 minutes with timers on specific parts of the puzzle itself (an average run will take approximately 10 minutes). 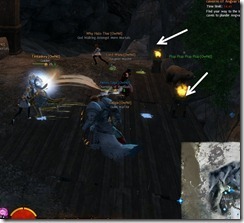 A minimum of six players is require but this puzzle get a lot easier when you have more players. 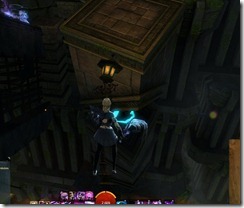 The puzzle starts off with a jumping puzzle right away. 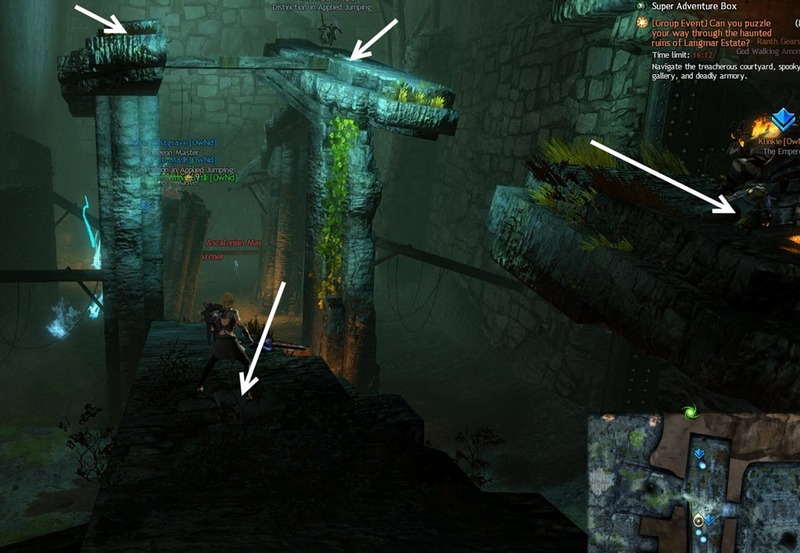 You will have to jump through several narrow planks that can be hard to see if there are too many players nearby. 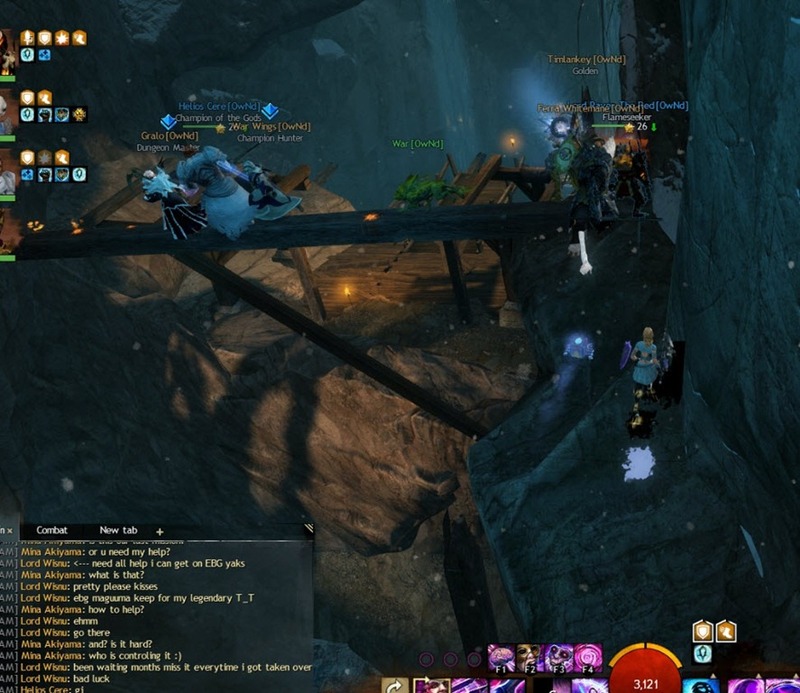 Luckily, if you do miss a jump, the fall won’t kill you here. To add to the fun, rocks will periodically fall from the ceiling and will knock you off the planks if you don’t avoid them. 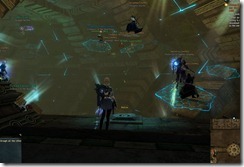 You will need to split your guild into two groups, one going down and one staying up. You will need at least 3 players on top and 3 players on the bottom but this gets a lot easier with more players. You will need to make five temporary platforms here to get at least 3 players across from one end of the chasm to the other so they can open the door to the next part. Your goal is to grab a bow from the shelf and aim at the icicles on the ceiling. Shooting the icicles will cause them to fall down on the ground, allowing the group down below to gather them to plug the steam vents to turn them into temporary platforms. 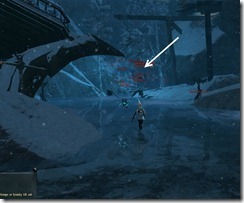 Most of the icicles will fall down with one hit from the bow but there is one big icicle that will take several hits to fall down. 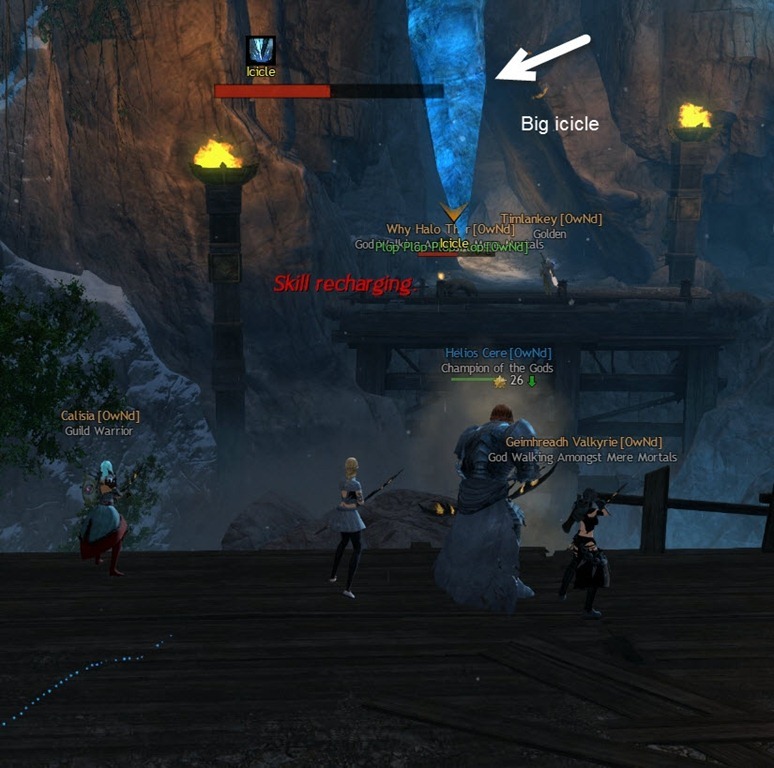 This big icicle will form a temporary platform a in the middle of the room that can be accessed by using the steam vent platforms. 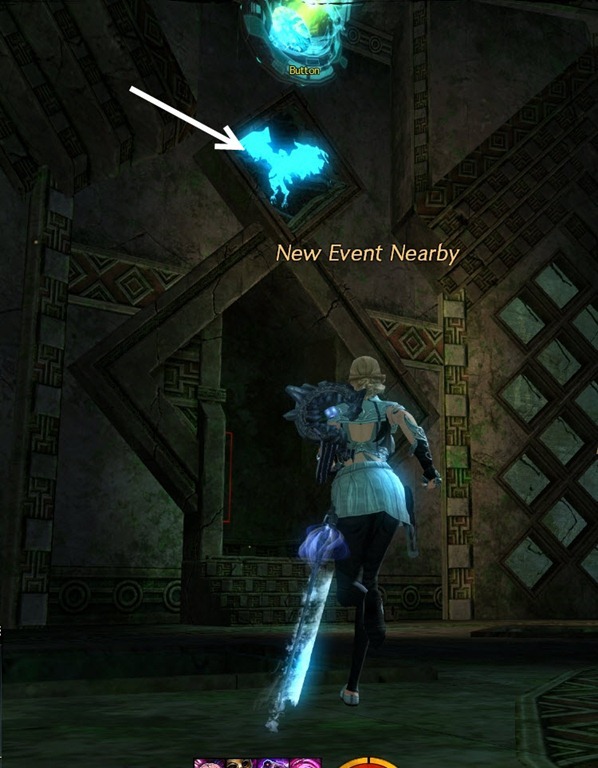 This platform is temporary, meaning that it will only last briefly (about a minute) before disappearing (it will reappear on the ceiling again for you to shoot down) . This means that you shouldn’t shoot down the big icicle until your steam vent platforms on the near side are nearly ready. 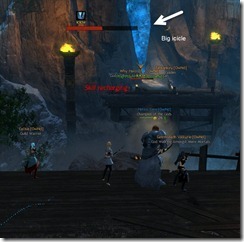 Once you make it to the big icicle platform, you will need to keep shooting the icicles so the group at the bottom can build the two steam vent platforms on the far side. Your job here is to gather the small icicles that fall off the ceiling and put them in the four holes that surround each steam vent. 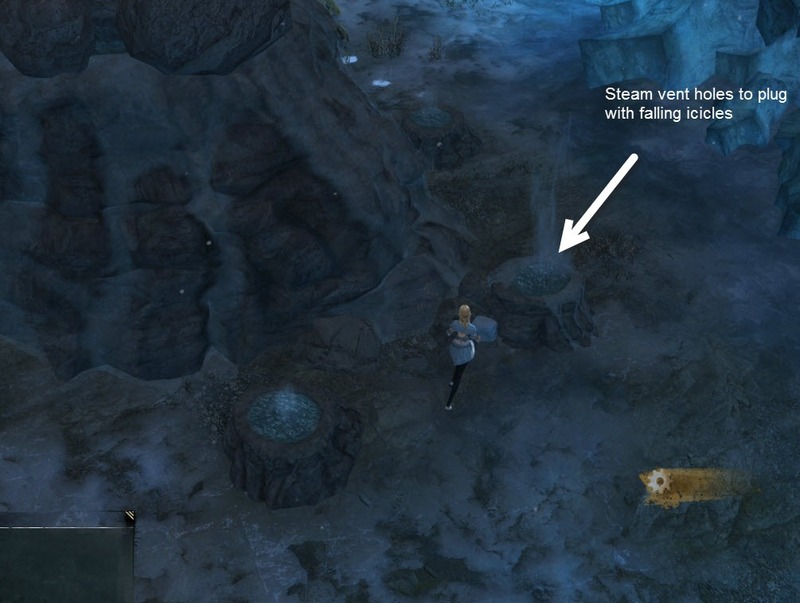 The icicles will temporarily plug these holes, causing a rock platform to rise above the steam vent for a few seconds once all four holes are plugged. There are four steam vents at the bottom but you won’t need to plug the two steam vents on the other side of the chasm until the big icicle platform falls down. 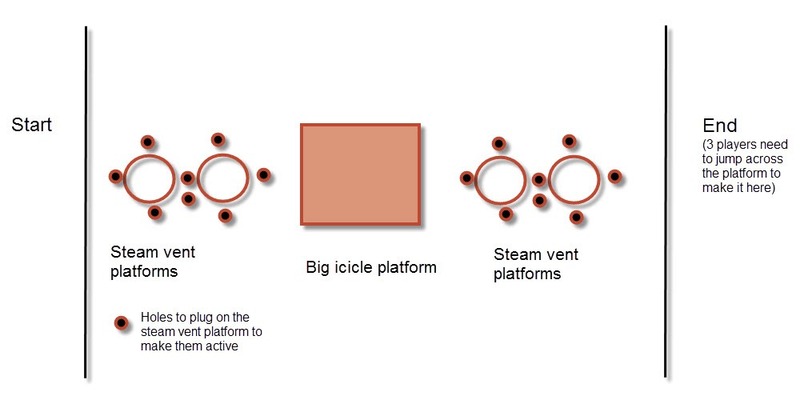 Since each steam vent platform only remain for a few seconds, you will want to make sure to raise the two steam vent platforms on either side almost consecutively if possible so that players can get across to the big icicle platform/other end without worrying about the steam vent platforms coming down mid-jump. Remember, the icicles will only plug the holes for a short duration before melting so both groups will have to work fast in bringing down the icicles and plugging the holes. 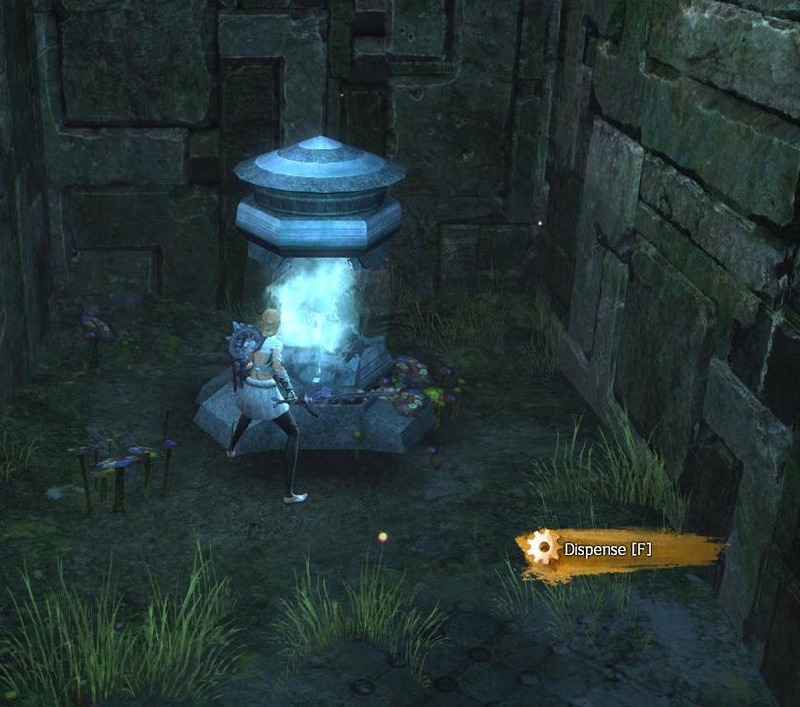 Once at least three players make it to the other side of the chasm, they will need to lit three torches simultaneously to open the door to the next part of the puzzle. 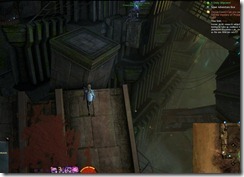 For the players at the bottom, there is also a gate that opens to allow you to proceed to the next section. 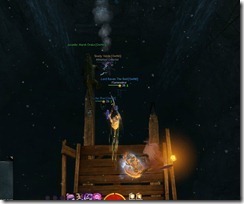 Part 3 – Jumping Puzzle with a ship. 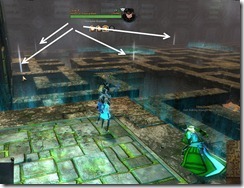 After you pass through the gates, there is another section of jumping puzzles with narrow planks. 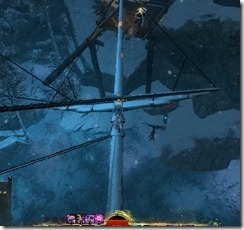 This time, if you miss a jump near the beginning, you will most likely plunge to your death below near the abandoned ship and will need to be resurrected by other players. Your goal is to make to the bottom with the abandoned ship. 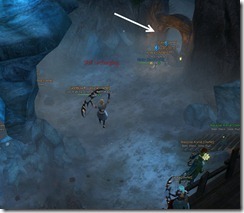 Once you are at the ground floor with the abandoned ship, look to your right for narrow cave opening guarded by imps. 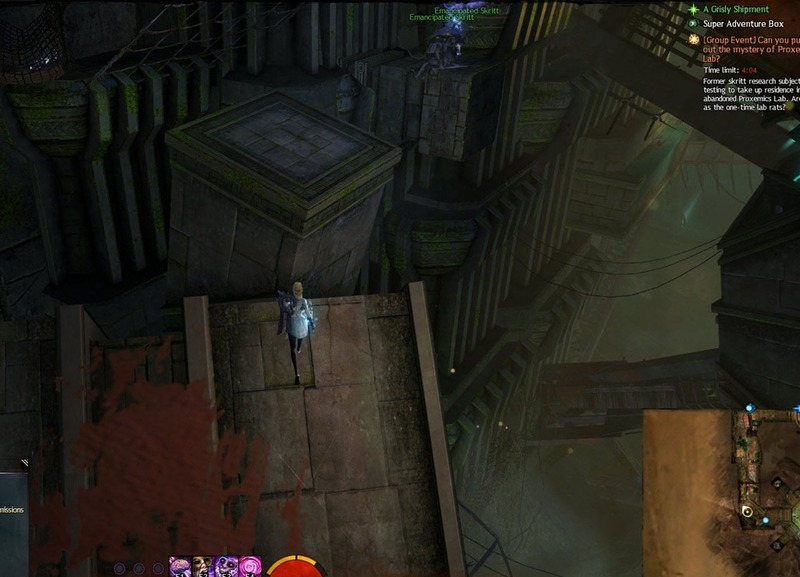 There is a small passage here that will bring you up on top of the ship so you can climb on top of its forward stem to proceed to the next part of the puzzle. There are two towers on either side of this section with a cannon up top that players can use to help knock down the icy walls but majority of the players should be grabbing powder kegs. 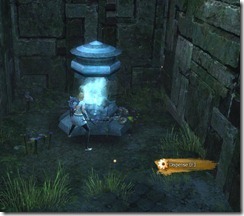 Powder kegs can be found at the start of this section of puzzle. You can plant them (#1 skill) on the ice walls that you come across. 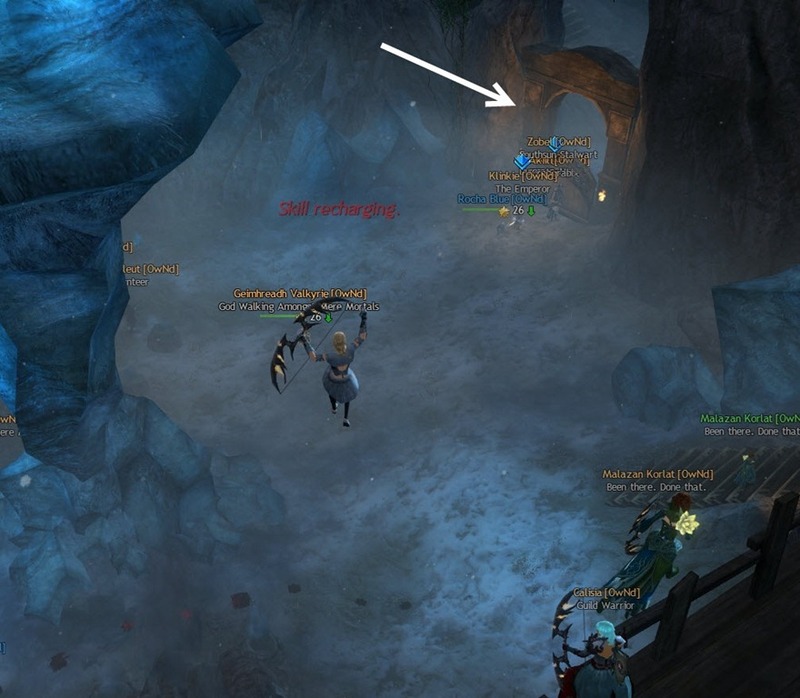 Each of the icy walls should only take 1 keg to break but the final sealed gateway will take about 3 kegs to destroy. 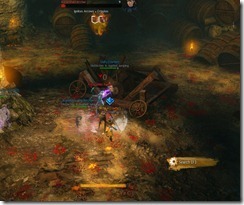 Each powder keg have a timer and they will self-detonate once the timer is reached. 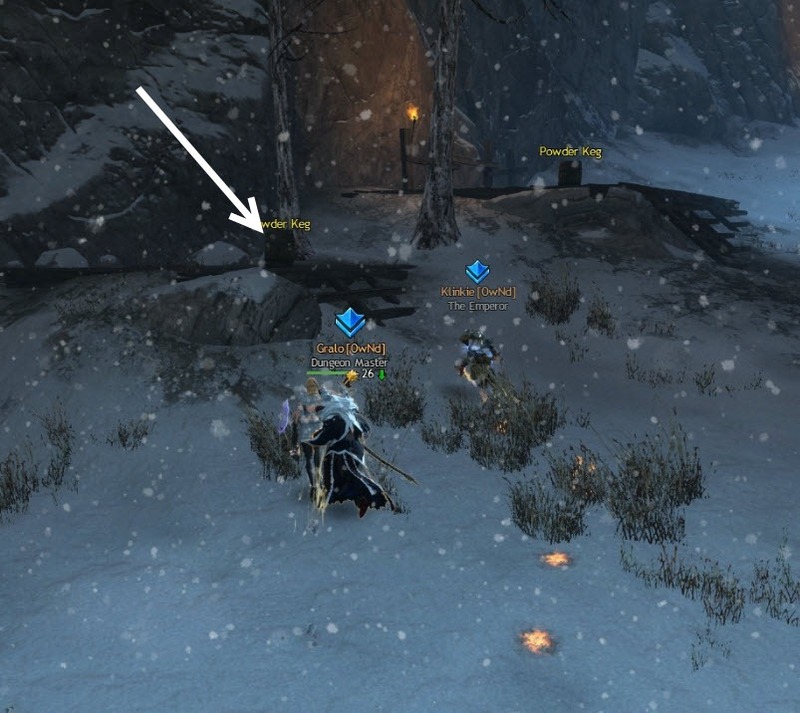 This means that you will need to move fast as a group here to ensure that you don’t lose powder kegs along the way. 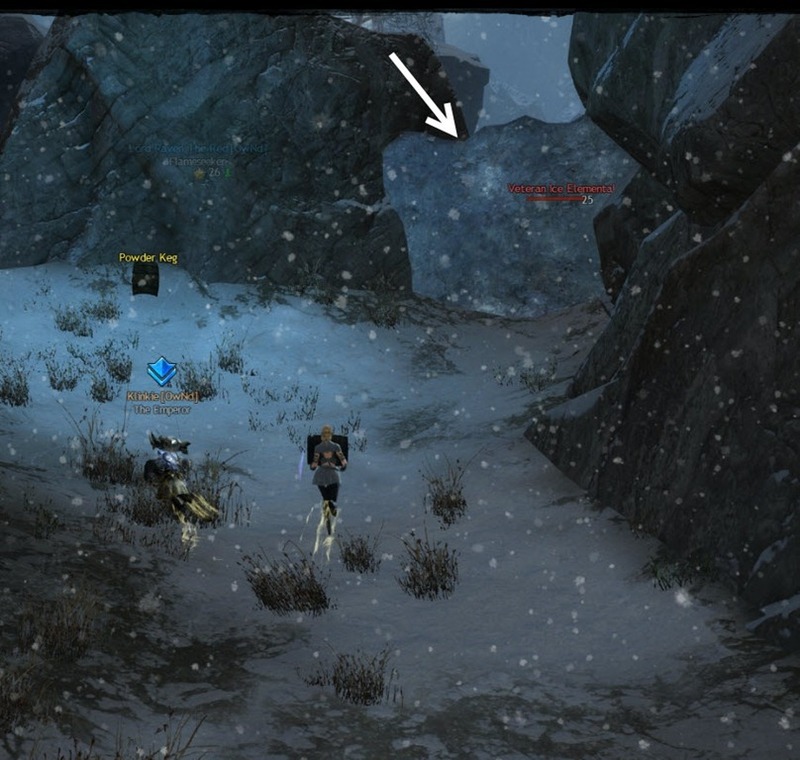 The ice walls will only respawn as well so don’t get left behind! 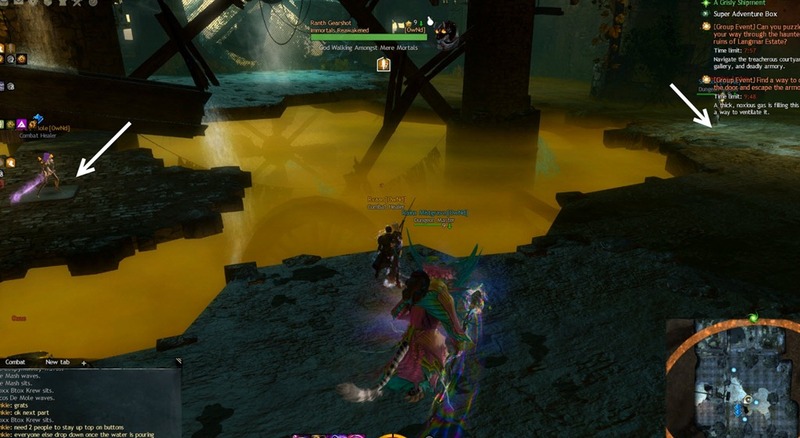 If you are bad at jumping across planks like, me, you will be happy to know that there will be a last bit of jumping puzzle before reaching to the final part of the puzzle. 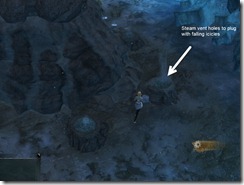 At end of the puzzle, take a dip in the water to swim to the next area. 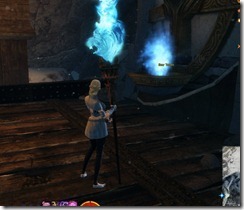 Part 6 – Light the ancient spirit totems with a sacred flame – 6 minutes. There are six shrines on either sides of the room and six totems at the end of the room. 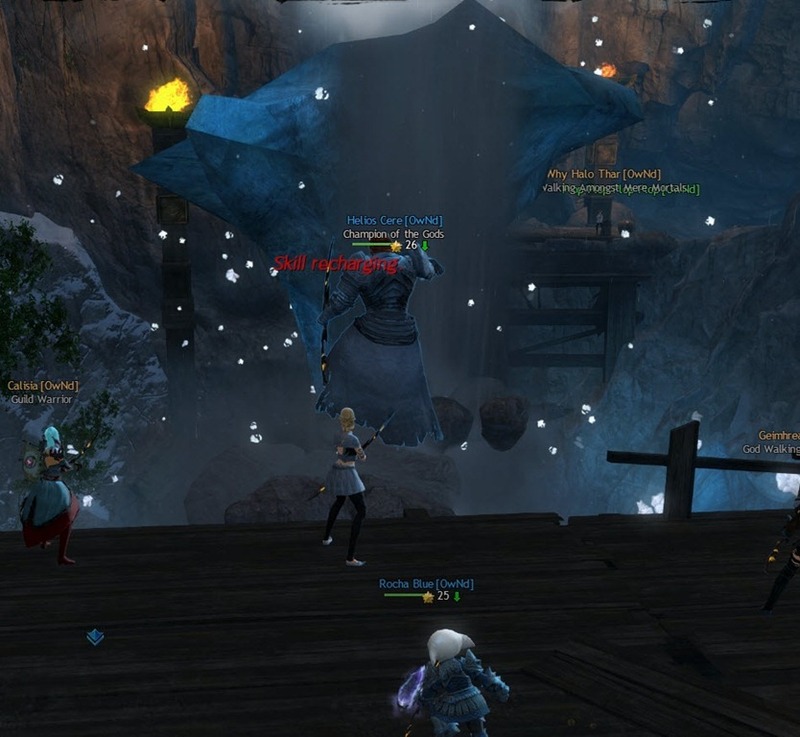 Also inside the room is a Legendary Drake Guardian that breaths fire, torches and eggs. 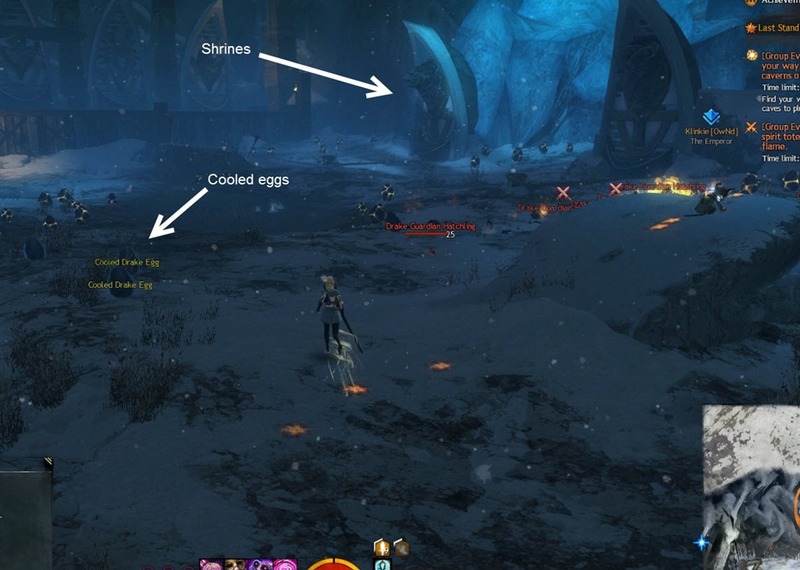 Your goal is to pick up cooled eggs to lure the legendary Drake to each of the six shrines to lit them up fire while killing the swarm of Drake Guardian Hatchlings. 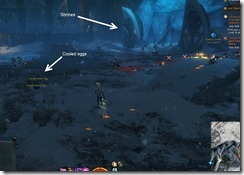 (Picking up regular eggs will only spawn more hatchlings). 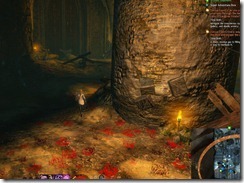 Once a shrine is lit on fire, players can lit their torches with the fire and go to the corresponding totem at the end of the room. 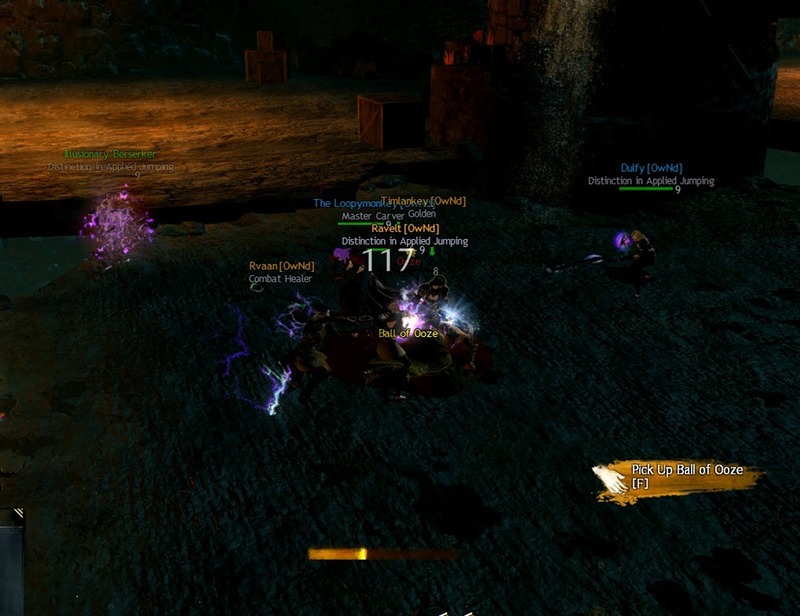 Once you have six players all with lit torches on each of the totems, they will need to coordinate to lit all six totems at the same time to open final door. 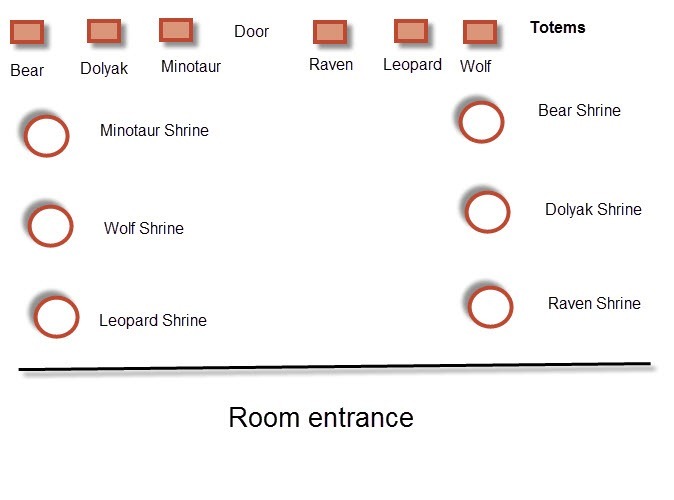 Each of the shrine represent a different animal so once you lit your torch near that shrine, make sure to go the totem with the same animal. Here is our room configuration, which might be randomized each attempt. 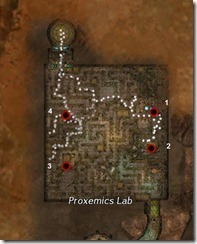 Proxemics Lab is located in NW corner of Brisban Wildlands. 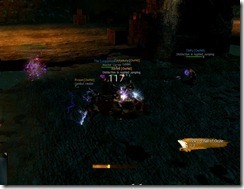 It has a time limit of 20 minutes and it is recommended to have six players or more to complete it. The lab itself is divided into various phases, some of them have their own timer. 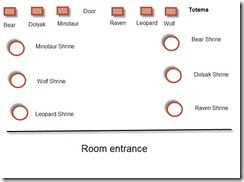 Phase 1 – Find a way to open the door and access the next room. To activate this phase, you need to press the button in the middle of the room. Once you pressed the button, the timer ticks down. You will need to go to the junk piles all around the room and find six batteries to deposit in the center. Each junk pile have a lot of random stuff but if you keep interact with it you will eventually find the battery (lighting sparkle thingie). While holding the battery you will be attacked by the skritt guarding each junk pile. If you get hit, the battery will get knocked out of your hands and you will need to find them in the junk pile again. 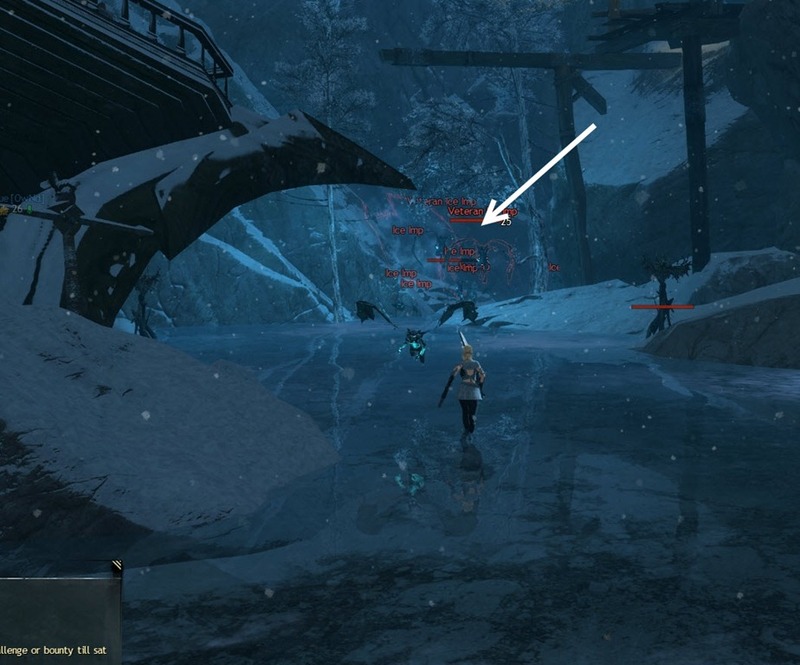 You cannot dodge while holding the battery and your running speed is slowed significantly. 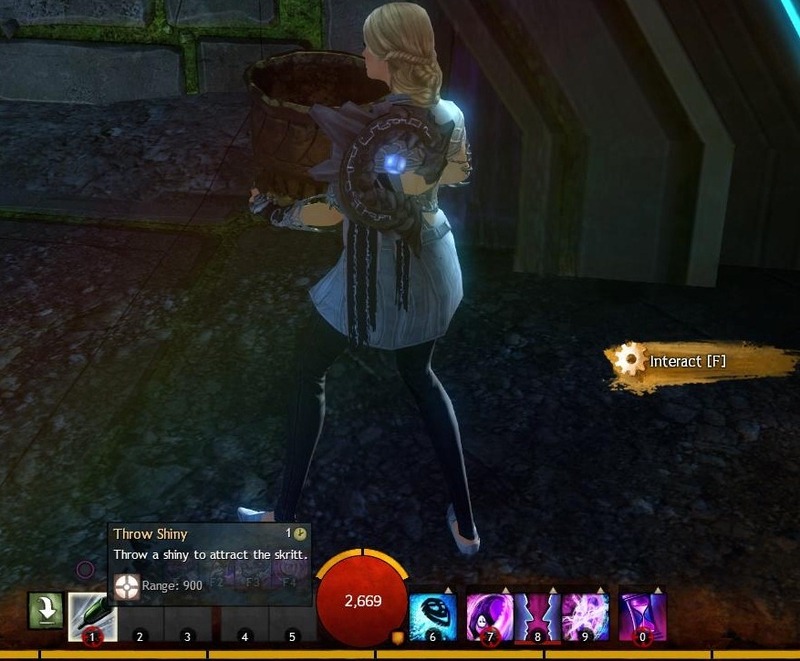 You can also get shinies in the junk pile (look like a pot) to throw at the skritts to distract them before you carry the batteries past them. There is a fairly standard and simple jumping puzzle. 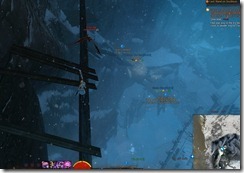 You can die if you fall from the highest platform. 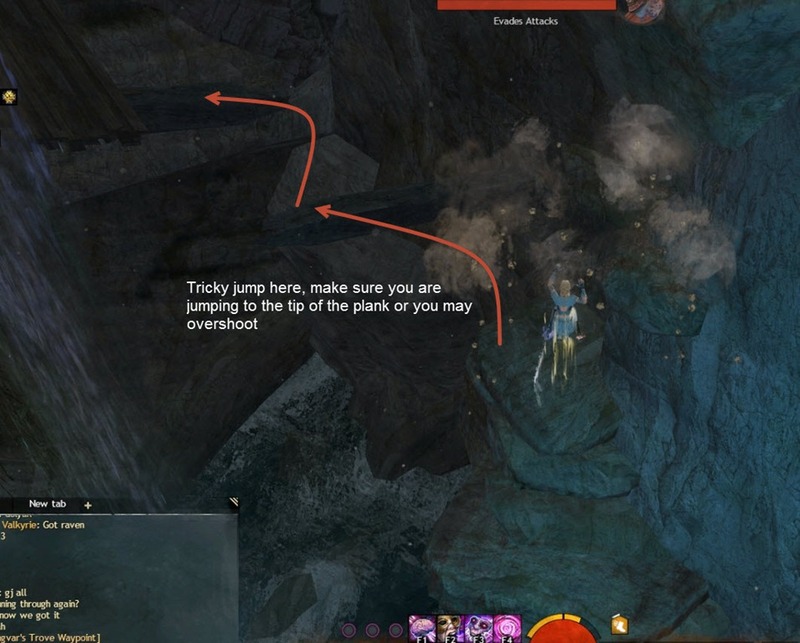 Those who have difficulty with the jumping puzzle can get down to the bottom and walk to the end to get a mesmer portal. There is a sketchy bit where you have to walk a bit on top of a narrow lamp post but rest of the jumps are fairly easy to make. 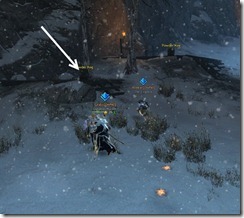 There is a button on the wall that you will need to click to start this phase. Make sure you have enough players inside the room before you start it. This room is an elevator with a mini game. All around the room you will see six cubby holes with an animal icon on top of each of them. 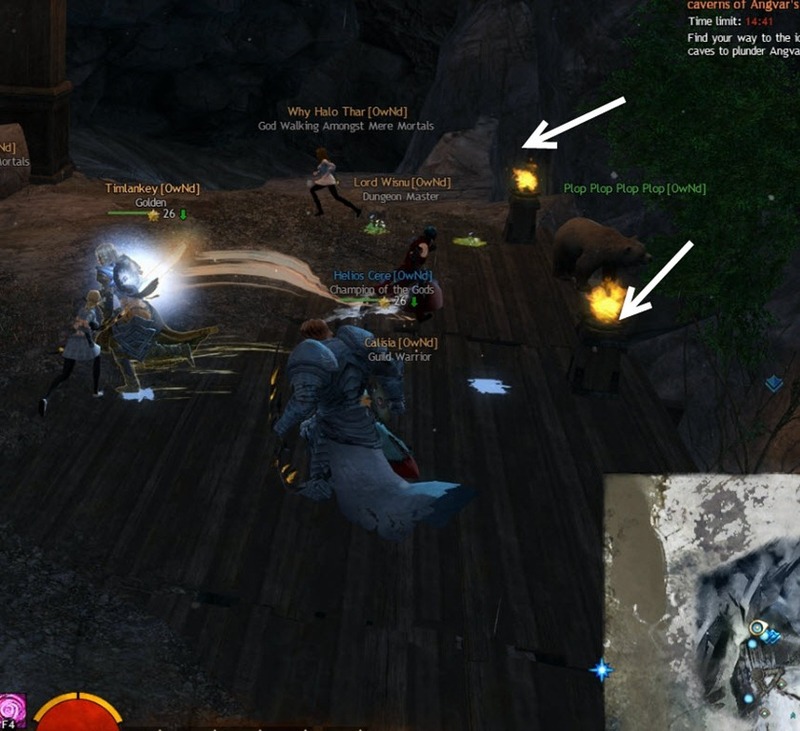 What you need to do is to find the same animal icon in the middle of the room and interact with it. This will transform you into that animal and you can walk into that cubby hole to activate it. 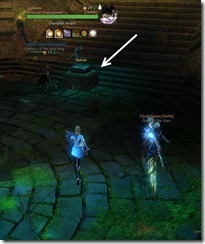 If you do it correctly, that cubby hole will have a blue bar inside it to signify that it has being activated. 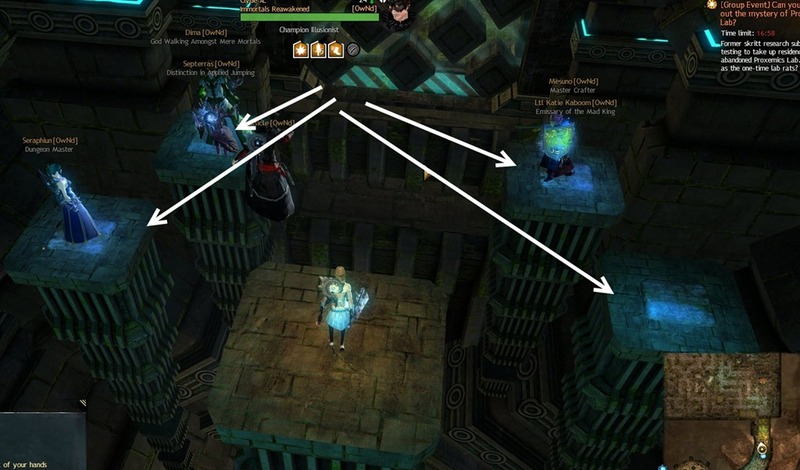 You need to activate all six cubby holes with 45 seconds and do this three times to get to the top floor. 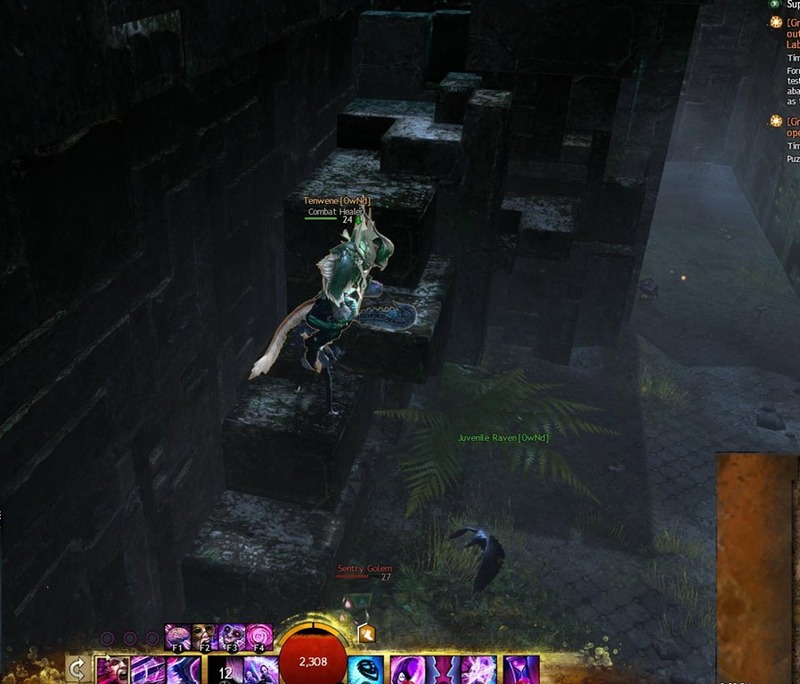 This is a timed jumping puzzle. You have about 20 seconds or so to make it to the other side before the platform disappears. If you see the platform is already activated when you get there, you may want to wait for the platforms to reset or otherwise you may not have enough time to get to the other side. 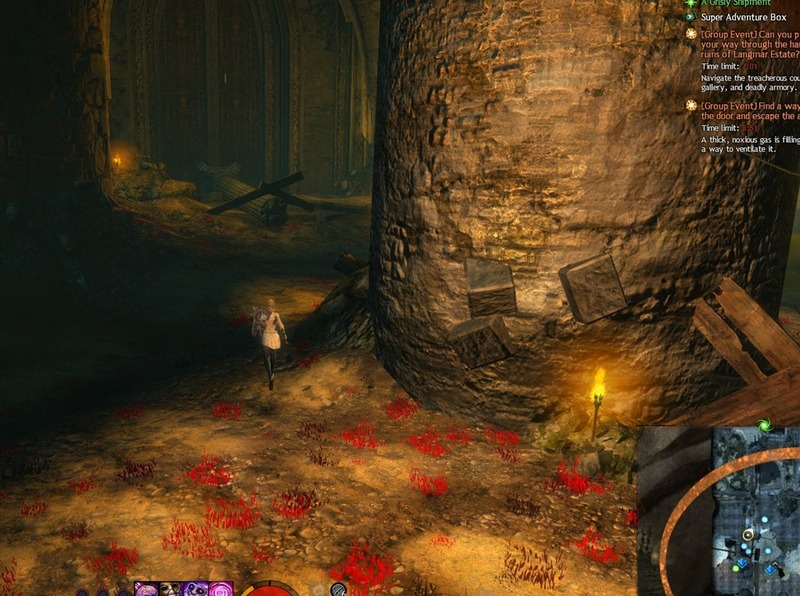 At the end of the puzzle will need four stone pillars. 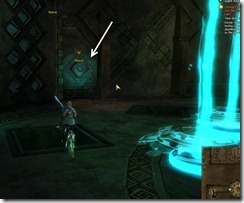 You will need a player on top each holding the activation switch down to open the door to the maze. 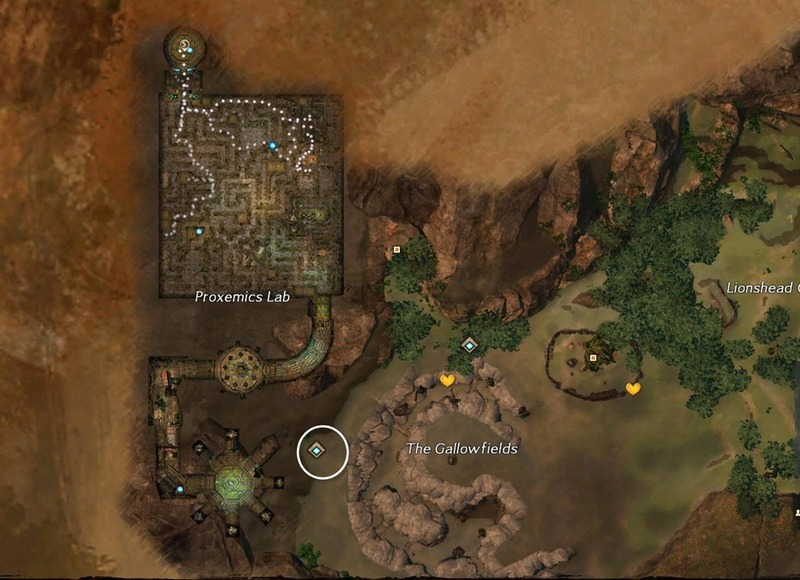 Before you can activate the maze, you will need to take a path to the left and this will bring you to a vantage point with an overview of the entire maze. 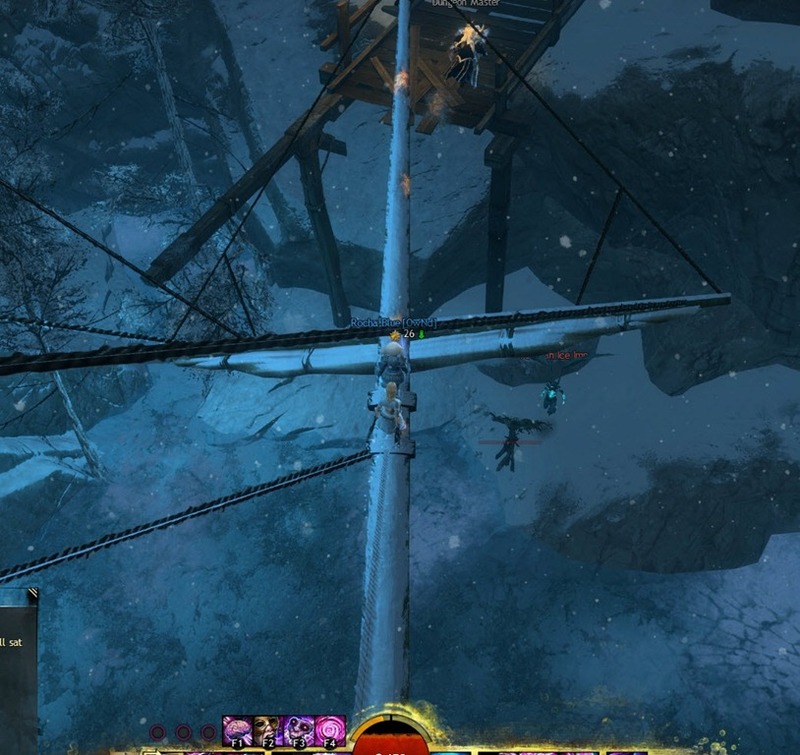 The first thing to note is these four pylons on top of the maze. They are always in the same spot and mark the locations of staircases inside the maze that you can cilmb to see where the orbs are hidden. 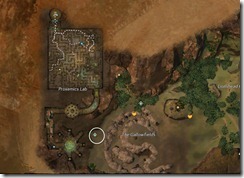 Here is a map of the maze with location of the staircases. 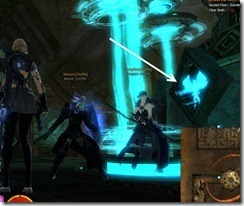 Once you activate the button at the vantage point to start the maze, you will notice light beams popping out in the maze. 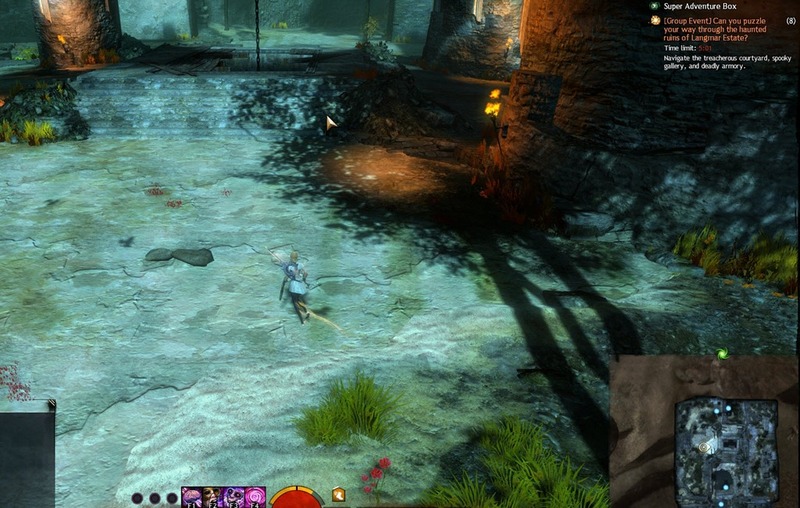 These light beams are generated by the six orbs and their locations are randomized each attempt. 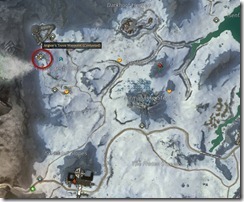 Take a note of the rough location of each orb. 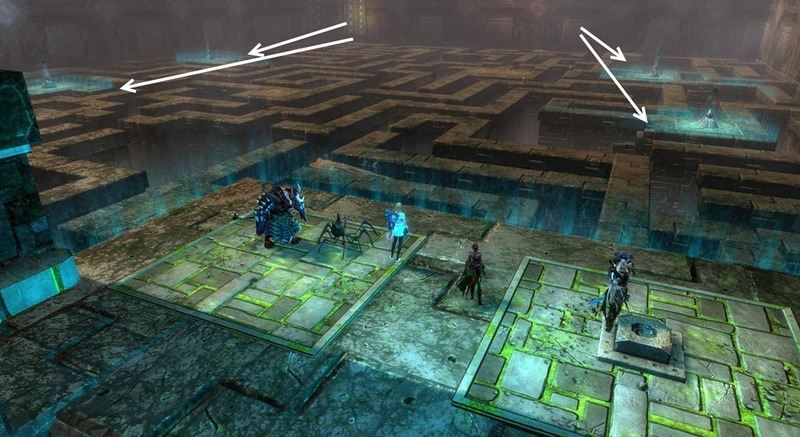 Once you are inside the maze, you can climb up the stairs to the pylons to help you locate the orbs. 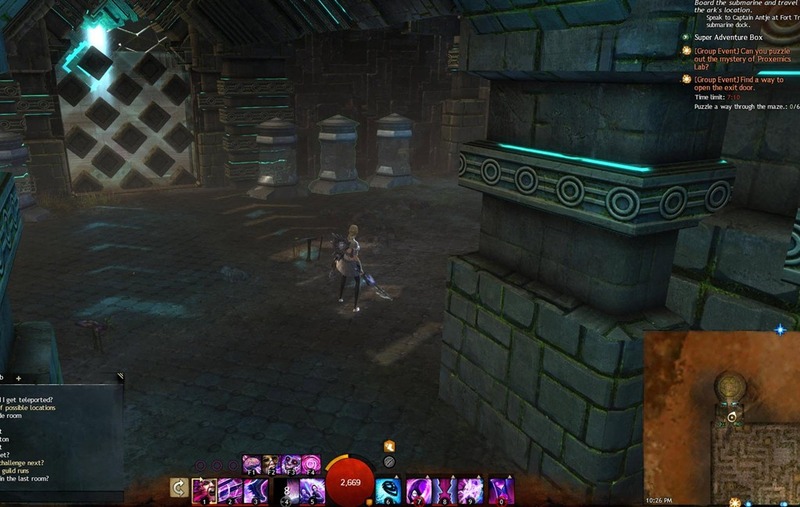 There are traps on the east side of the maze that you can disable by climbing the stairs to these pylons on the east side. 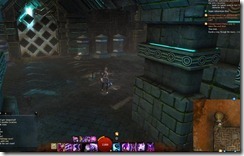 Note that some of the walls can be destroyed and the orbs are often hidden behind these destroyable walls. 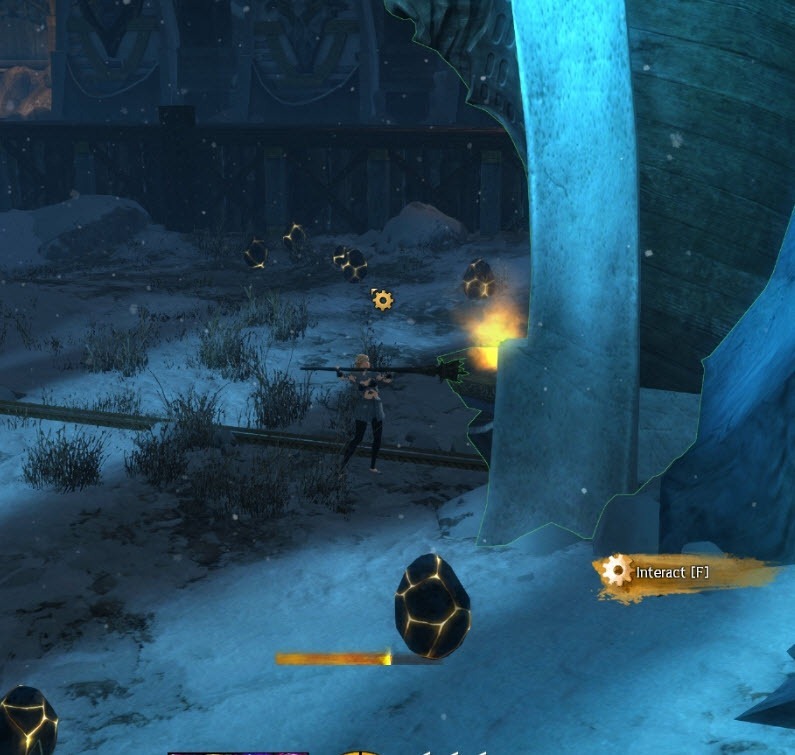 Once you have the orb, carry it to the end of the maze in the NW corner and deposit in one of the six tanks. 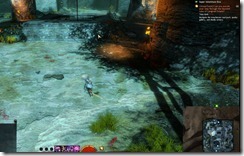 There are quite a bunch of skritt mobs, sentry golems, a legendary NPC that you will want to avoid. 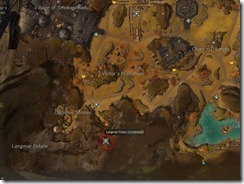 Langmar Estate puzzle is located in SW corner of Plains of Ashford. 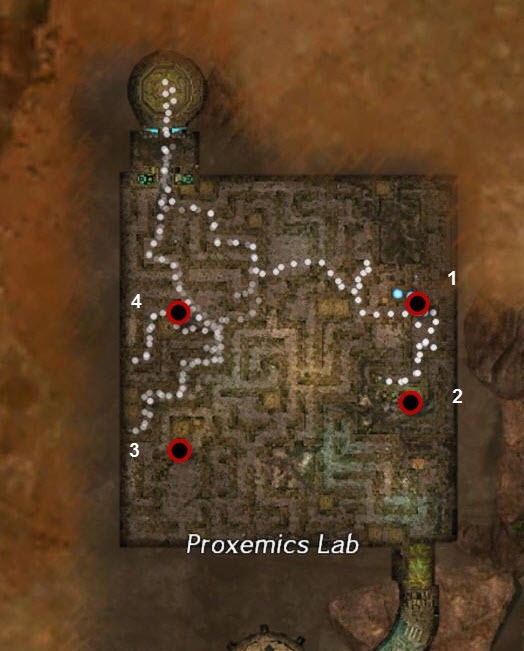 Like Proxemics Lab, it has a time limit of 20 minutes and it is recommended to have 6-12 players (6 if you can jump under time pressure, 12 if you want make it easier) to complete. Phase 1 – Find a way to open the door and escape the courtyard. Time Limit: No time limit specified but this event will fail if you take too long. 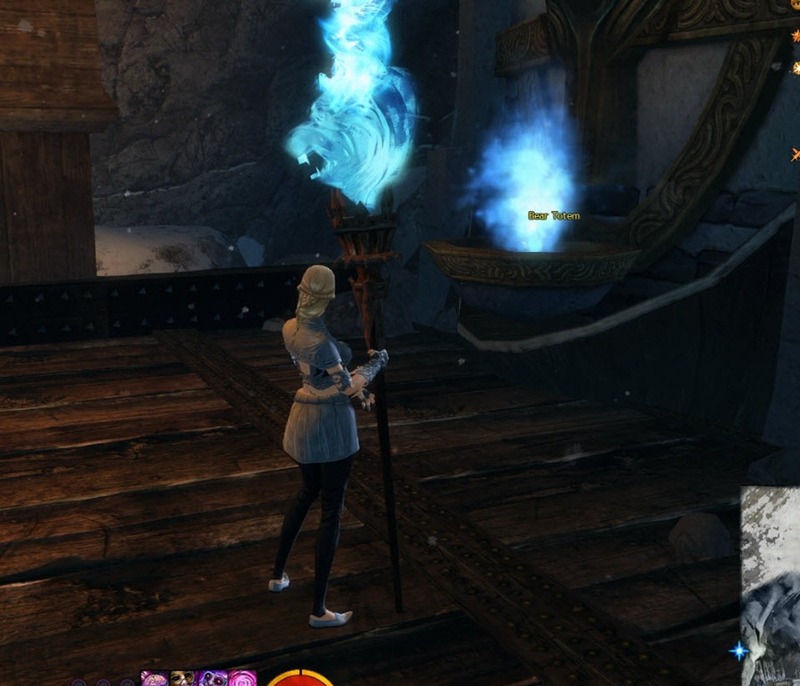 Objective: Grab weapons from the weapon racks and put them on Charr statues. 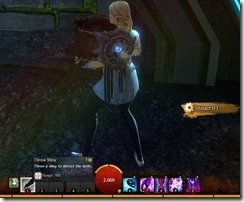 Charr Staff will match Human Bow. 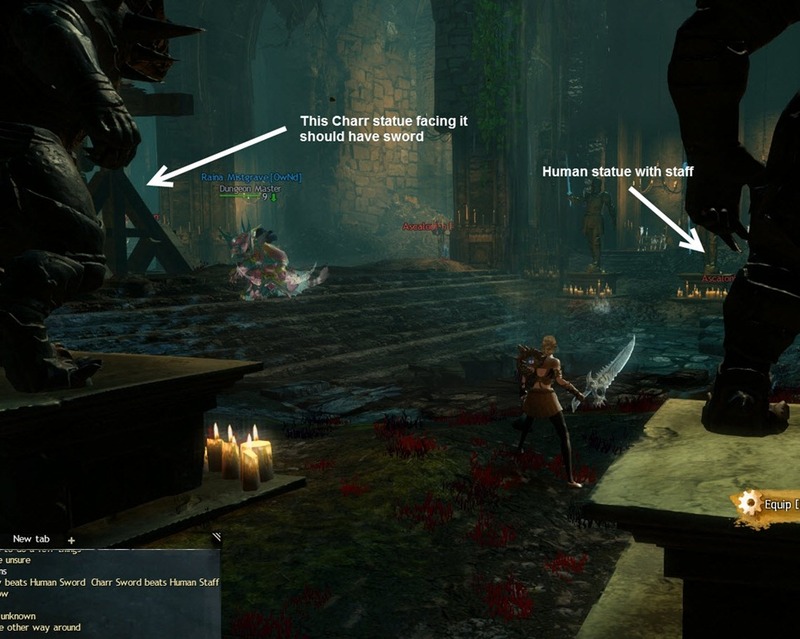 The goal here is to let the Charr statues win by giving them weapons that will allow them to beat their human statue counterpart across from them. 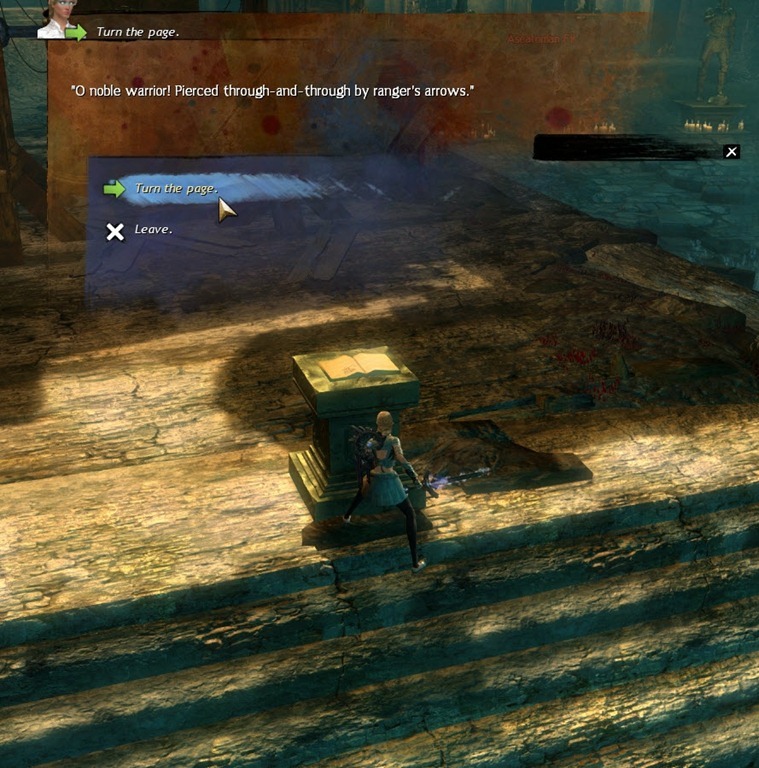 Once all six Charr statues are armed with weapons, the door will open. 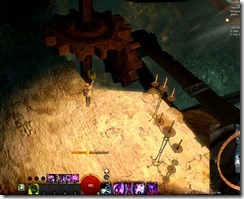 To open the locked gate, you need to have four players, each standing on a lever on the platform above (involves a bit of jumping). Time Limit: 4 seconds to open all six curtains on the inside and 44 seconds to do the corresponding emote on the outside curtains. 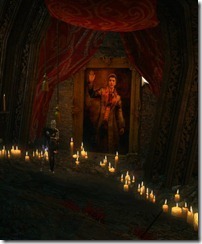 Objective: Perform the emote that on the outer curtain that is indicated by the corresponding inner curtain. 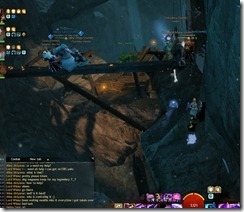 This part can be done with six players if all the players can jump under a time limit. You can eliminate the jump factor by having 12 players, six on inner curtains and six in outer curtains. 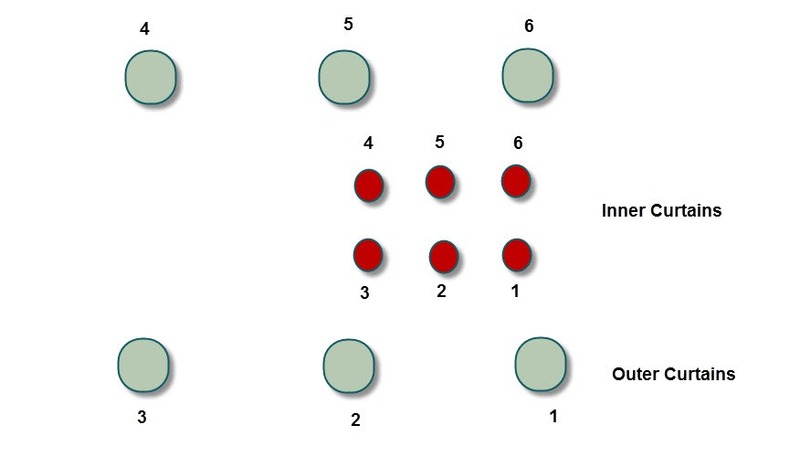 Using 12 players do require some coordination between the players on the inner and outer curtains. The first thing you will notice in this room are the curtains. There are six on the inside and six on the outside. 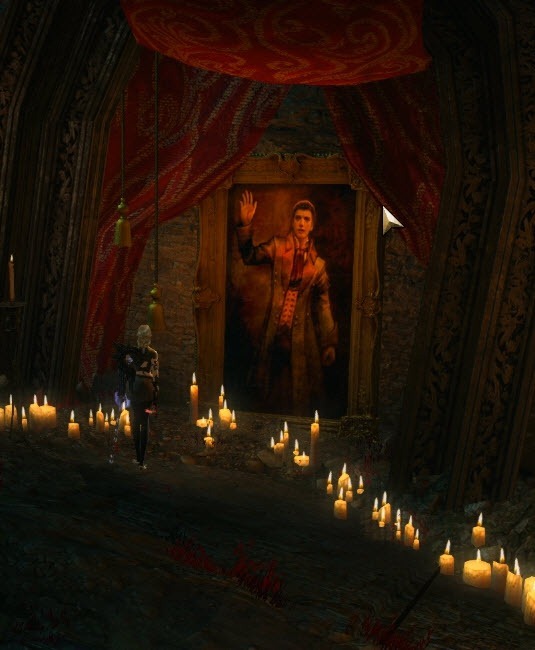 The inner and outer curtains corresponds to each other in the sense that players on the inner curtains will open it up to reveal an emote that must be performed on the corresponding outer curtain. 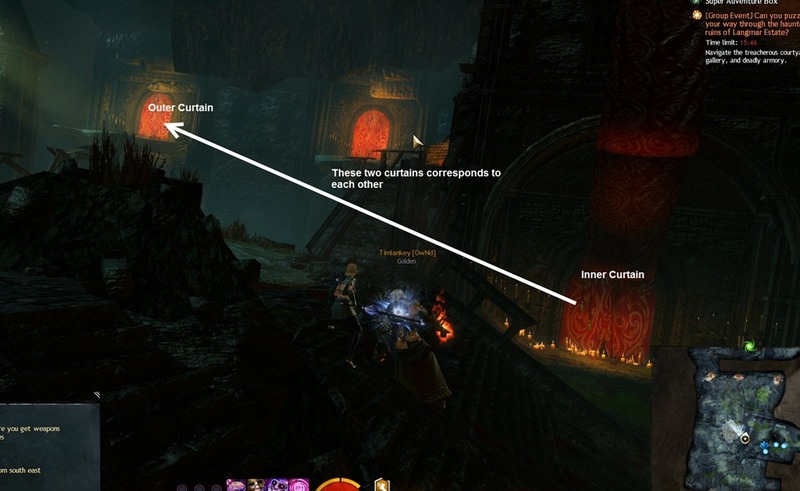 Once the emote on the inner curtain is revealed, you have 44 seconds to perform that emote on the corresponding outer curtain. If you are doing this with just six players, you have 44 seconds to jump to the matching outer curtain to do the emote. 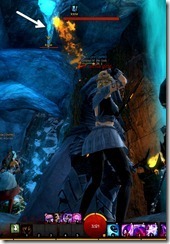 If you are doing this with twelve players, then you have 44 seconds to communicate to the outer curtain players. 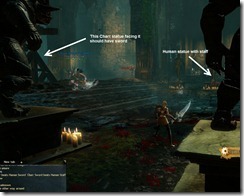 There is no penalty if you perform a wrong emote at the outer curtain so technically you can “cheat” by spamming all the possible emotes at each outer curtain. Objective: Clear the poison gas, get to the bottom floor to build a makeshift ram to break down the door to escape. There are three levels to the next room. 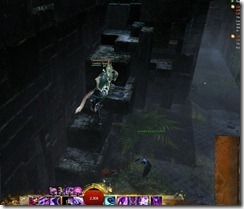 The top level have two buttons that players need to stand on top of. 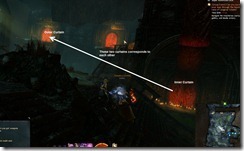 Doing this allow the water to flow to the second level and dispersing the poison gas temporarily. 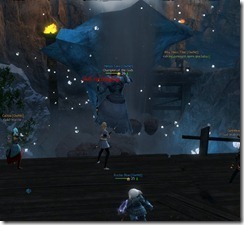 On the second level players will find oozes. 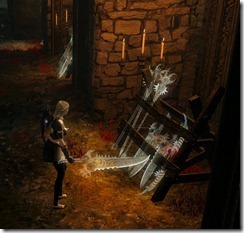 Killing these oozes will drop Ball of Ooze that you can use to grease the rusty gears and make them turn. This will keep the poison gas out as long as the wheels are turning. Make sure you have players on this level keep killing the oozes and grease the wheels or the poison gas will return. On the bottom floor, you will find a bunch of broken carts guarded by Ascalonian ghosts. 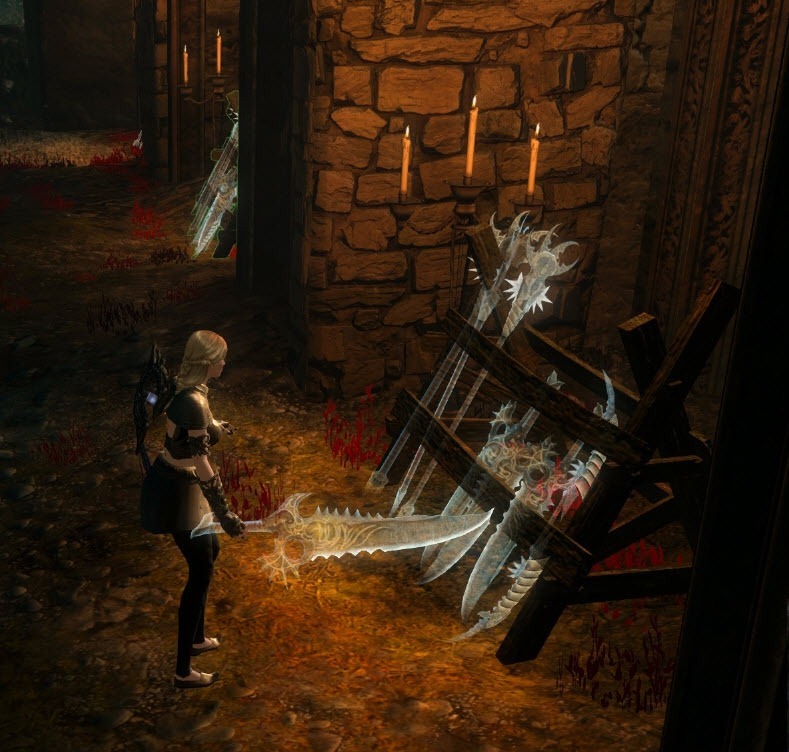 You will need to gather a bunch of materials from these broken carts (wood plank, metal rods, rope etc) and then bring them to the locked door north of you. These materials will form a makeshift ram. 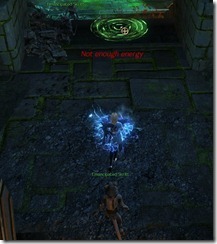 You can launch the ram into the door and after a couple of seconds the door will burst open, revealing the chest ahead. 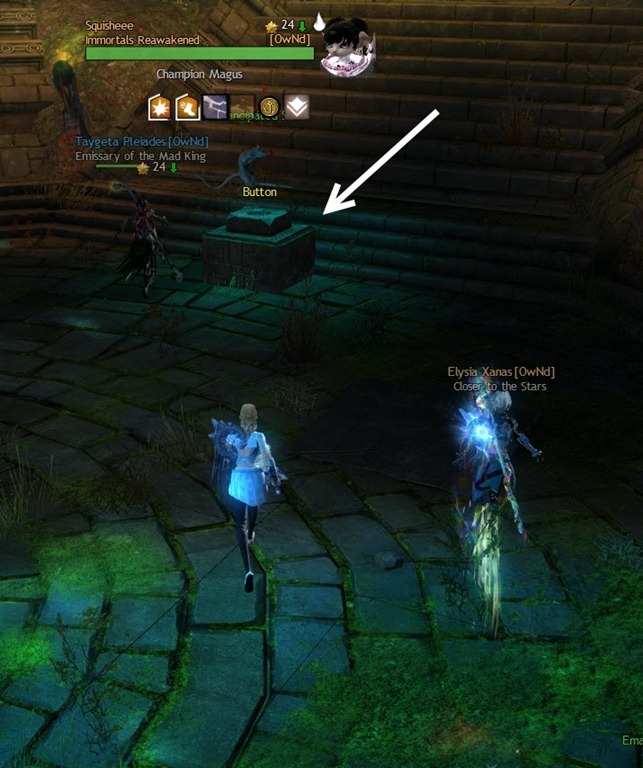 Don’t forget to grab a second chest on your way out (it is underwater inside a well). There are only two puzzles available in the game yet? The one in snowden is not yet active. Your link to this page from your menu tabs is directed to a Reddit thread that points back here…. 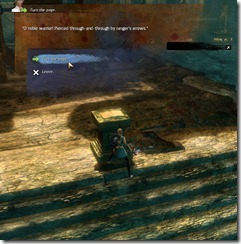 Any info on Angvar’s Trove? 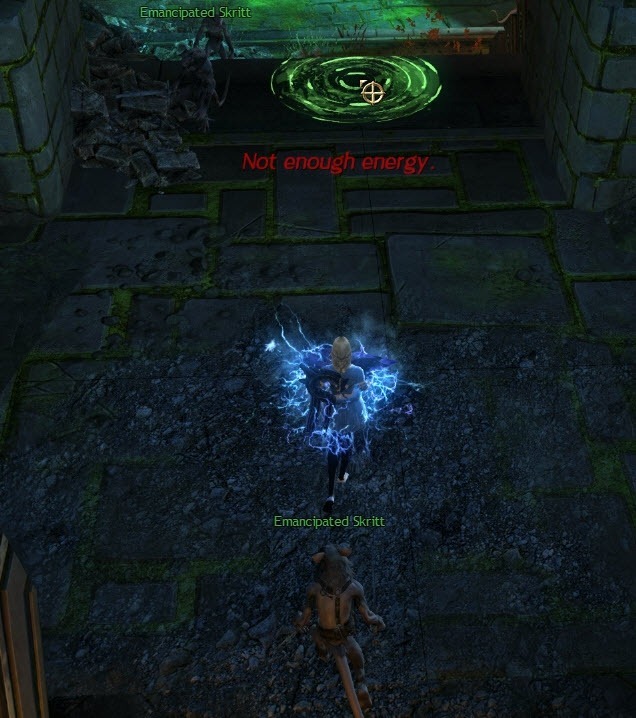 You can port people who get locked out of the puzzle in certain areas. Done this a few times but now I finally know everything :3 thanks for the guides! 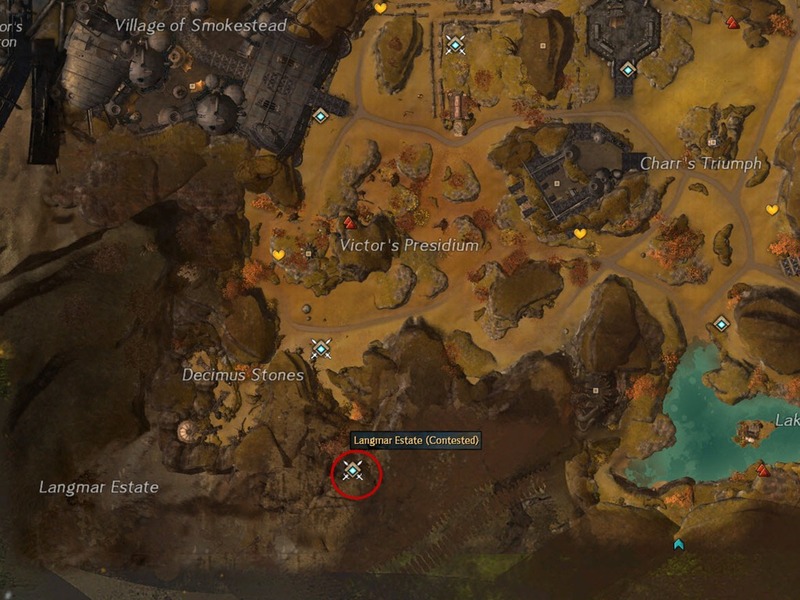 Just as info, Langmar estate is currently broken, the last phase doesn’t register properly and is impossible to finish.